Talmudist at Constantinople in the second half of the fifteenth century. In answer to the appeal of the Karaites, whose literary degeneracy was then notorious, he consented to instruct them in the rabbinic disciplines; imposing only the conditions that his pupils should refrain from vilifying the Talmudic authorities, and from desecrating the holy days of the rabbinical calendar. This attempt to reconcile the Karaites with Talmudic Judaism, or at least to soften their hostile attitude toward it, did not meet with the approval of the rigorists among the rabbis. Even Moses Capsali, who certainly was independent enough otherwise, stoutly opposed his relative, Eliezer (perhaps chiefly because it was not customary to treat the Karaites in a friendly manner; see Elijah Mizraḥi, Responsa, No. 57). Lattes, Liḳḳuṭim Shonim, p. 17. Turkish Talmudist and historian; born at Candia about 1490; died (there?) about 1555. In 1509 Capsali left his native city to study at Padua under Judah Minz; but Judah dying eight days after Capsali's arrival, the latter went to Meïr Katzenellenbogen, Minz's son-in-law and successor. In 1522 Capsali was again at Candia, having been appointed leader of the community there, with three assistants. During the terrible plague which appeared in Candia soon after, entailing upon the Jews great suffering, which was aggravated by the policy of isolating the Jewish quarter, Capsali worked unselfishly to relieve the stricken. When Menahem del Medigo, rabbi of Candia, became too old to officiate, Capsali and Judah del Medigo were appointed rabbis of the community; and Capsali continued there until his death. Among his pupils, Samuel Algazi deserves especial mention (compare Nepi-Ghirondi, "Toledot Gedole Yisrael," p. 6, below). Capsali carried on a learnedcorrespondence with the greatest Talmudists of his time; he showed a remarkable independence of spirit, not only in his relations with high authorities, but also in regard to ancient, time-honored customs. For instance, he abolished the custom, widely spread in Candia, of selling by auction the honor of bridegroom of the Torah; ordering instead that this should be conferred gratuitously upon a scholar or other prominent person of the community (Ḥayyim Benveniste, "Keneset ha-Gedolah, Oraḥ Ḥayyim," to 669; i. 88c). The independence and self-confidence manifested by Capsali in his decisions aroused the opposition of many of his colleagues. The responsa literature of that time contains numerous references by prominent rabbis to the controversies between Capsali and his associate rabbi of Candia, Judah del Medigo; the former always inclining to a less rigorous interpretation than the latter (compare Moses Alashkar, Responsa, No. 114, p. 177; Nos. 99, pp. 111-114; Meïr Katzenellenbogen, Responsa, No. 29). 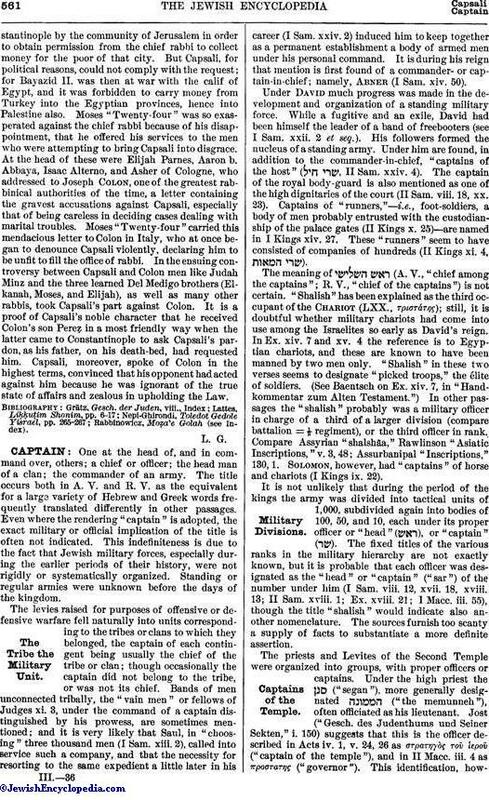 Abraham ibn Naḥmias was another opponent of Capsali (Benveniste, l.c. pp. 261, 263, 342). Capsali is the author of the following works: (1) "Sefer Dibre ha-Yamim le-Malkut Winiẓiah"; (2) "Seder Eliyahu Zuṭṭa," or "Debe Eliyahu"; (3) "No'am Ḥoblim," decisions and responsa; and (4) a collection of responsa. The first work is a history of Venice, the manuscript of which is in the British Museum. It contains, in addition, matter relating to other Italian cities, and a section on the persecutions of the Jews in Germany. The second work, a history of the Turkish empire from the earliest times down to the year 1522, is an important contribution to general history, as well as to the history of the Jews. This book (in manuscript in the Bodleian Library and in the British Museum), the publication of which would certainly throw much light on the history of the Jews in Turkey, contains a section on Spain and Portugal down to the expulsion of the Jews from those countries. Judging from the extracts made by Lattes, Capsali was not only an excellent stylist—possessing neither the baldness of the chroniclers nor the exuberance and affectation of the elegists—but was also a reliable historian. Capsali added to the work, which is divided into 4 books and 166 sections, a treatise on theodicy. His interest in history is also seen in his collection of responsa, "No'am Ḥoblim," in which he narrates numerous interesting occurrences relating to the Rabbis (compare, for example, the extract in Grätz, "Gesch der Juden," viii. 443-445, which refers to the controversy between Joseph Colon and Moses Capsali). Capsali's responsa seem to have entirely disappeared: Ḥayyim Benveniste is the only one known to have possessed and used a copy of them. Turkish Talmudist and philanthropist of the second half of the fifteenth century. He was a pupil of his uncle, Moses Capsali, at Constantinople but left that city and settled at Candia, where he became one of the most prominent members of the Jewish community. In 1493 he was "condestable" (high constable), one of its highest officers, and in that capacity was specially active in relieving the sufferings of the Spanish exiles who arrived that year in Candia. In one day (July 22, 1493) he collected for their assistance 250 Venetian gulden, a very large sum for that time. Many notes on the history of the Ottoman empire in Elijah Capsali's work were communicated to him by Elkanah, his father. Luzzatto, in Wiener, 'Emeḳ ha-Baka (Hebr. part), p. 20. Chief rabbi of the Ottoman empire; born in Greece 1420; died about 1495 at Constantinople. When a young man he left his native country in order to study at the German yeshibot. He is next mentioned as rabbi of Constantinople about 1450; but he became prominent only during the reign of Sultan Mohammed II., who appointed him chief rabbi of Turkey. The sultan thought so much of the rabbi that he assigned to him a seat in the divan beside the mufti, the religious head of the Mohammedans, and above the patriarch of the Christians. 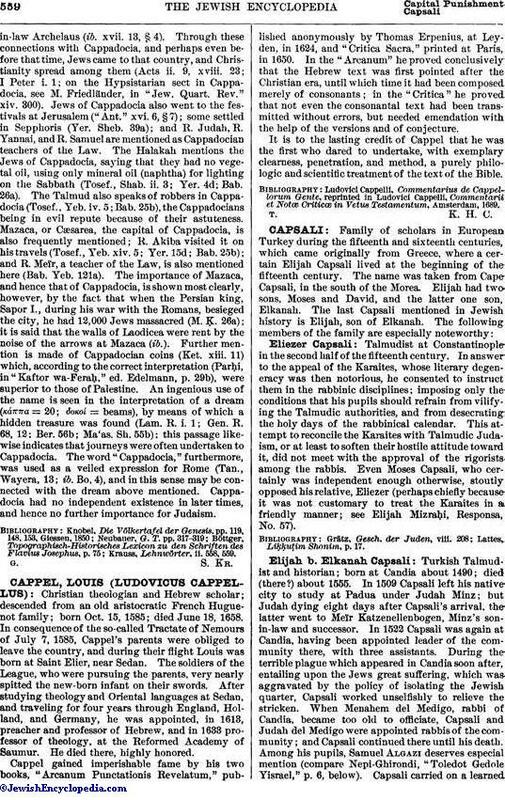 Capsali held various offices, which included the supervision of the taxes of the Jews, and the appointment of rabbis, and he even acted as a civil judge. It is said that the sultan's respect for the rabbi was due to the fact that, disguised as a civilian, Mohammed was present one day while Capsali was rendering his decisions; and he assured himself that the rabbi was incorruptible and impartial in his judgments. When the sultan undertook to improve the moral conditions of some parts of Constantinople, it was said that this endeavor was prompted by the rabbi. It is certain that Capsali dealt very severely with Jewish youths who, intimate with the janizaries, imitated them in leading un-Jewish and immoral lives. Some of these youths, enraged by the corporal punishment he had inflicted on them, attempted to kill him during a street riot in 1481, and he escaped only by flight. Capsali's associations with Bayazid, the son and successor of Mohammed II., were equally pleasant; and Bayazid's friendliness toward the Jews, that became especially evident in the ready reception of the Spanish exiles, must be ascribed in no small measure to Capsali's influence. Capsali directed communal affairs with considerable skill, and commanded general respect. Ascetic in his mode of life—fasting frequently, and always sleeping on a bare floor—he was an advocate of rigorous rabbinism, severely criticizing the attempt of some rabbis to instruct the Karaites in the Talmud (compare Eliezer Capsali above). Nevertheless he seems to have taken certain liberties in various ritual questions, that made him many enemies. A party was formed at Constantinople for the purpose of injuring Capsali's reputation, and of branding him as an ignorant and unscrupulous rabbi. At the head of this clique was Moses "Twenty-four," said to have been so called because he knew only the twenty-four books of the Bible and nothing of the later literature, and who had been sent to Constantinoplestantinople by the community of Jerusalem in order to obtain permission from the chief rabbi to collect money for the poor of that city. But Capsali, for political reasons, could not comply with the request; for Bayazid II. was then at war with the calif of Egypt, and it was forbidden to carry money from Turkey into the Egyptian provinces, hence into Palestine also. Moses "Twenty-four" was so exasperated against the chief rabbi because of his disappointment, that he offered his services to the men who were attempting to bring Capsali into disgrace. At the head of these were Elijah Parnes, Aaron b. Abbaya, Isaac Alterno, and Asher of Cologne, who addressed to Joseph Colon, one of the greatest rabbinical authorities of the time, a letter containing the gravest accusations against Capsali, especially that of being careless in deciding cases dealing with marital troubles. Moses "Twenty-four" carried this mendacious letter to Colon in Italy, who at once began to denounce Capsali violently, declaring him to be unfit to fill the office of rabbi. 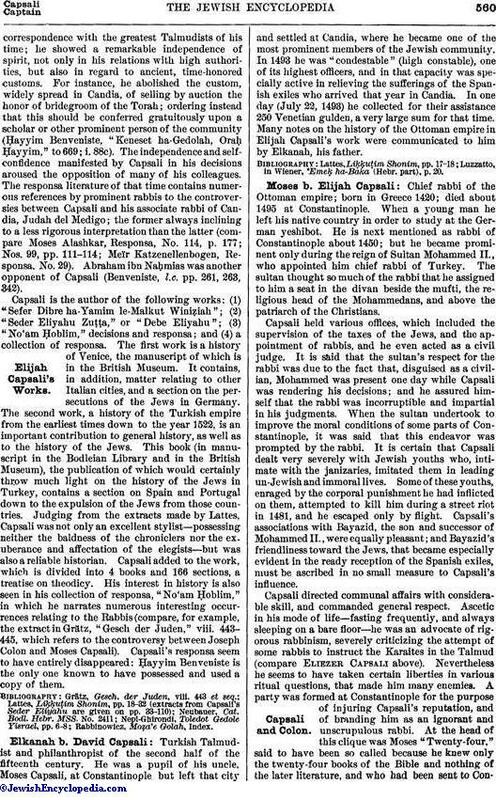 In the ensuing controversy between Capsali and Colon men like Judah Minz and the three learned Del Medigo brothers (Elkanah, Moses, and Elijah), as well as many other rabbis, took Capsali's part against Colon. It is a proof of Capsali's noble character that he received Colon's son Pereẓ in a most friendly way when the latter came to Constantinople to ask Capsali's pardon, as his father, on his death-bed, had requested him. Capsali, moreover, spoke of Colon in the highest terms, convinced that his opponent had acted against him because he was ignorant of the true state of affairs and zealous in upholding the Law. Rabbinowicz, Moẓa'e Golah (see Index).